Pick K points as the initial centroids from the dataset, either randomly or the first K.
Find the Euclidean distance of each point in the dataset with the identified K points (cluster centroids). Assign each data point to the closest centroid using the distance found in the previous step. Find the new centroid by taking the average of the points in each cluster group. Repeat 2 to 4 for a fixed number of iteration or till the centroids don’t change. Si is the set of all points assigned to the ith cluster. 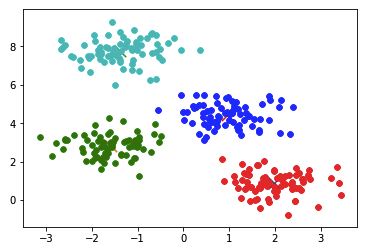 The output of the clustering we wrote from scratch is similar to the one we get by using the sklearn library. 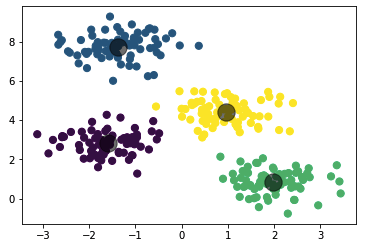 In our implementation we chose the first 4 points as our initial cluster centroids which may give slightly different centroids each time the program is run on random dataset. We can also use the K-means++ method to choose our initial centroids. k-means++ was proposed in 2007 by Arthur and Vassilvitskii. This algorithm comes with a theoretical guarantee to find a solution that is O(log k) competitive to the optimal k-means solution. Sklearn KMeans class uses kmeans++ as the default method for seeding the algorithm. Thank you much for your explanation, it is very clear! 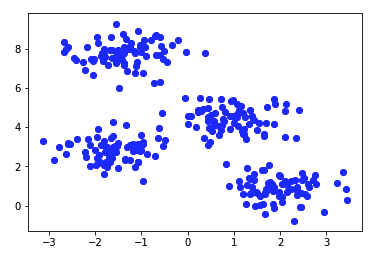 There is a slight mistake in python code: in the # start K-Mean clustering loops, the nested loop should be looped using another iterator than i. It causes mistakes.